This Turner Classic Movies film collection is a great, inexpensive gift for a horror fan. It contains four scary classics with well-known horror characters. If you want to see classics about Frankenstein and Dracula, then get ready for 358 minutes of horror fun! The movies included in the deck are Horror of Dracula, Dracula Has Risen from the Grave, The Curse of Frankenstein, and Frankenstein Must Be Destroyed. Christopher Lee and Peter Cushing are the lead actors here. 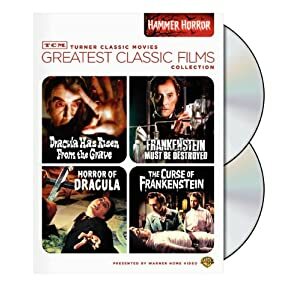 This set is highly recommended for those who want to be introduced to the wonderful and creepy world of Hammer Horror.